The blend of regality, mysticism, and afterlife comes together in perfect harmony in many cultures, but the celebration of it is near perfected in a few. Dia de Muertos has come to coincide with the excitement of All Hallows Eve but holds the celebration for nights afterwards. Communing with the spirits of the beyond and calling their attention can bring great rewards and those who go all out to speak with the spirits come away with more than just an evening in memoria! You too can join in the grandeur of beautiful colors, painted faces, celebrations, and don’t forget the conjuring of spirits! 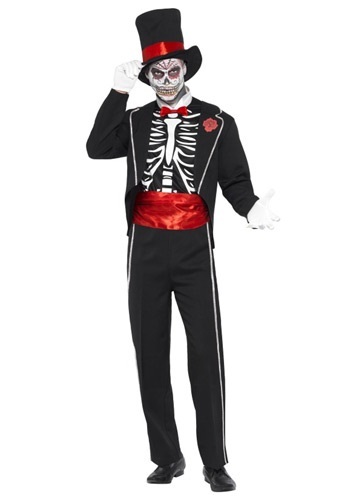 Deck yourself out in this regalia of the Day of the Dead costume and be ready to be one with the night of spirits. A regal-looking black jacket with glimmering silver trim includes a bright red rose on your chest lapel that matches perfectly with a formal bow tie and cummerbund. 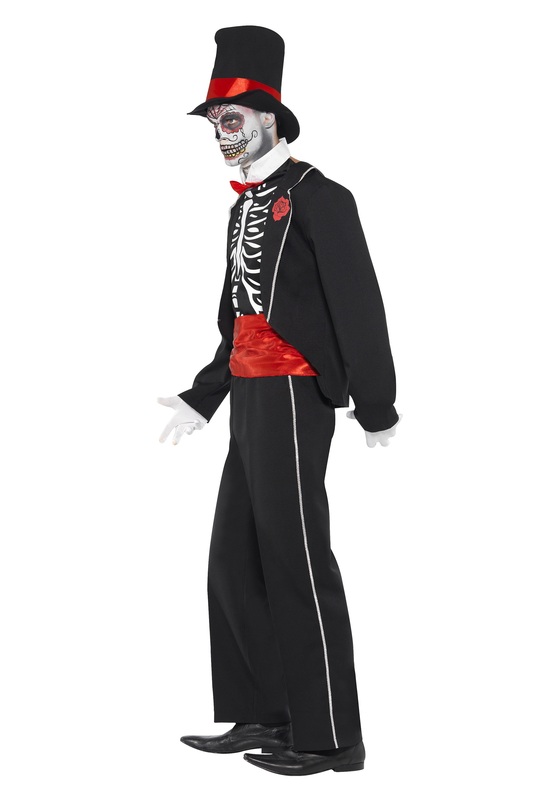 Tailored for high undead society, show off your bleach-cleaned rib bones that make for a stark contrast with your black top hat and pure white gloves. Include the right kind of face paint and you will be right there with the modern day translation of an ancient Middle American celebration. Or with the same costuming and a few additional accessories, move your celebration to Louisiana and channel the spirits through the might of the mysterious voodoo priest, Samedi. This All Hallows Eve, unite numerous cultures as well as the spirits of the beyond all while showing off your dapper and noble style!